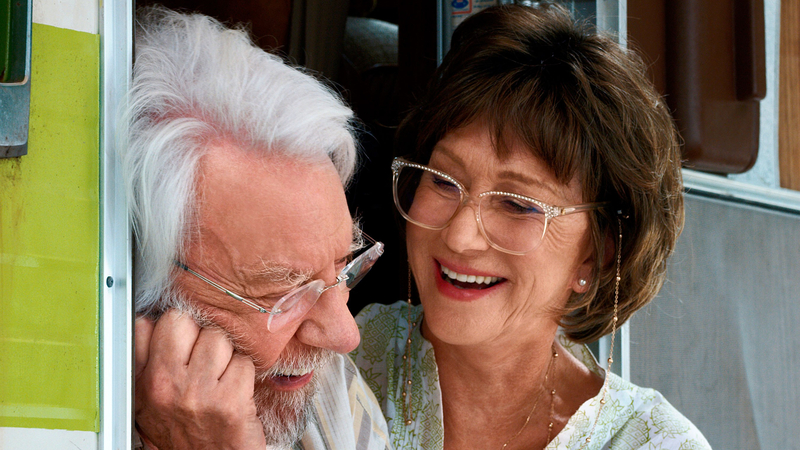 With a puff of exhaust smoke and some dodgy steering, Helen Mirren and Donald Sutherland trundle into UK cinemas as an elderly married couple on a final holiday in the battered RV that gives Italian director Paolo Virzi’s first English language film its title: The Leisure Seeker. Adapted from Michael Zadoorian’s novel, the film is a tragi-comic road movie dealing with mortality, memory and the consolations of love. As America lurches along the Presidential campaign trail towards the November election, Ella (Mirren) and John Spencer (Sutherland) take off in their old clunky Winnebago – nicknamed The Leisure Seeker – much to the chagrin of their two adult children Jane (Janel Moloney) and Will (Christian McKay). It’s understandable that they’re worried. Their folks are both in ill-health: John is suffering from Alzheimer’s and really shouldn’t be behind the wheel, while Ella is due to go into hospital for treatment of her cancer. But having no intention of going gently into that good night, Ella wants to take John finally to visit his beloved Hemingway’s house on the Florida Keys. They’re an odd couple. John is a former English teacher who can quote swathes of Joyce and Hemingway by heart, whereas Ella is a chatterbox, a people person with a taste for whiskey. They’re not so much chalk and cheese as cheese and wine – decidedly different but going very well together. Which isn’t to say they both don’t have skeletons in their closet – John is particularly obsessed by an old boyfriend of Ella’s called Dan who he jealously suspects she still harbours affection for. Likewise, Ella can be jealous of all the students who have adored her husband. But together they are familiar, good-humoured, full of affection and love for one another in a way that is strangely rare to see in the cinema. The main test to their relationship is John’s failing mind. It’s a tragedy of which he himself is fleetingly aware (“My stupid empty head”) and which breaks Ella’s heart. During the day they have a variety of adventures – a diversion to see an old historic village, a run in with robbers, even a trip to see old flame Dan – and in the evenings Ella shows John a slide show of their lives, desperately attempting to blow on the embers of his fading memory. The subplots sometimes feel ridiculous – though Mirren on a motorcycle is always going to be worth it – and sometimes feel redundant: the political background feels added on and Will and Jane struggle for relevance. The fact is this is Ella and John’s story. It is their love, with still some discoveries to make even at this late stage. Their ill-health rudely interrupts moments of joy and this is no Hollywood fantasy that cleans up their ailments for genteel consumption. A dance ends when Ella vomits on the rug and John pees himself. Physical deterioration threatens their dignity at every turn, but their resilience and their humour are formidable and above all their love (including sexual) for each other is affecting in the extreme. Having unfortunately close personal experience of John’s malady, it is difficult for this reviewer to maintain critical objectivity. False sentimentality can be a danger. However, The Leisure Seeker is dry-eyed even at its most moving and a celebration of love even as it reaches its end.